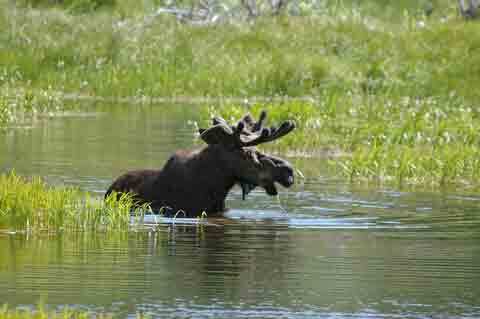 A few of these Bull Moose Pictures appear on our other pages (some are new). We have just collected them all in on place for your viewing convenience. 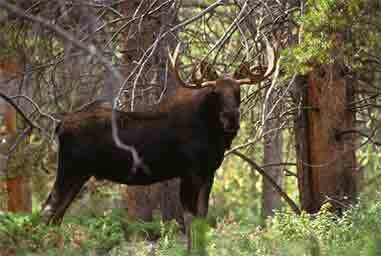 This mature Bull Moose is in full velvet. This Moose appears to be staring at the camera, I wonder what was going through his mind at the moment the picture was taken? Can you think of a good caption for this picture? He looks as though he may be wet, maybe he just crossed the river behind him? 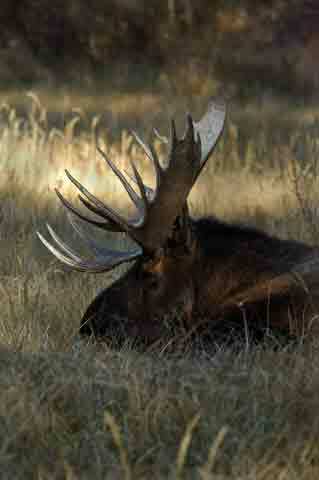 Another mature Bull Moose, this one is having a rest. 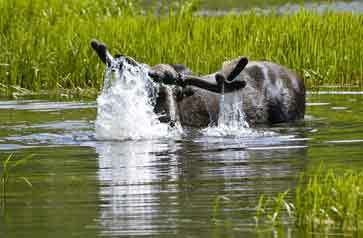 Maybe he is getting ready for a sparring match to keep his harem of cow moose? We can tell this is a mature bull because the eye guard portion of his antlers have three or more points. This bull is looking at you and trying to decide if he should run! Curiosity stance before he moves. Chances are he'll swing his head and trot off. This photo makes the bull look as though his belly is very full. Once the rut begins, bulls no longer eat. He'll survive off the fat he has built up until now. Note the beautiful fall colors. Springtime feeding on aquatic plants that are rich in nutrients. Just lifting his head from feeding on the aquatic plants. He'll be chewing the plants and getting ready for another dive. This bull has just started to loose his velvet. When bulls lose their velvet, it is not uncommon for them to eat the pieces they rub off. 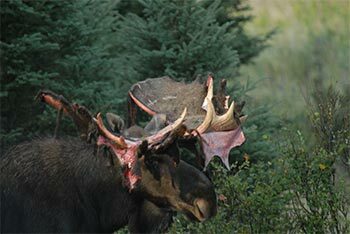 A moose researcher has a hard time to find any velvet because of this. Photo was taken by Dr. Vince Critchton in 2008. 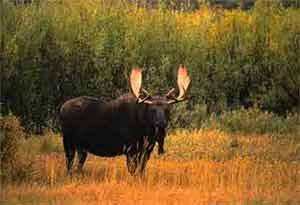 Dr. Critchton studies Moose and has written many articles about them. 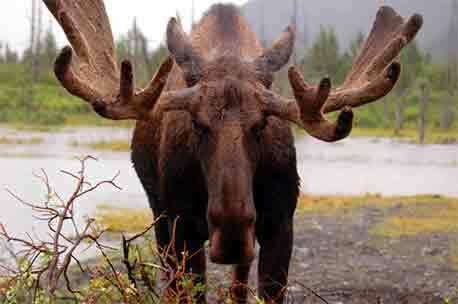 I hope you have enjoyed the Pictures of Moose. Follow this link to see the pictures that have been contributed by others or comment on them.